It all starts in the mid 1960′s with a company called G.D. Searle. 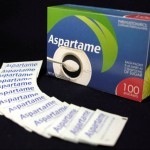 One of their chemists accidentally creates aspartame while trying to create a cure for stomach ulcers. Searle decides to put aspartame through a testing process which eventually leads to its approval by the FDA. Not long after, serious health affects begin to arise and G.D. Searle comes under fire for their testing practices. It is revealed that the testing process of Aspartame was among the worst the investigators had ever seen and that in fact the product was unsafe for use. Aspartame triggers the first criminal investigation of a manufacturer put into place by the FDA in 1977. By 1980 the FDA bans aspartame from use after having 3 independent scientists study the sweetener. It was determined that one main health effects was that it had a high chance of inducing brain tumors. At this point it was clear that aspartame was not fit to be used in foods and banned is where it stayed, but not for long. This page contains a single entry by sal published on February 7, 2013 11:00 AM. The Tamiflu Deception was the previous entry in this blog. Melanie’s Marvelous Measles: Is The Backlash Justified? is the next entry in this blog.